Preprints are bingo game pattern printed onto the faces of bingo cards. Organizations use them for Regular, Special and Jackpot games to make it easier for players to locate the pattern being played. This feature results in faster play, players purchase more cards and organizations earn ore income and PROFIT. Players also like the preprints because they don’t have to pre-dab their cards for special pattern games. 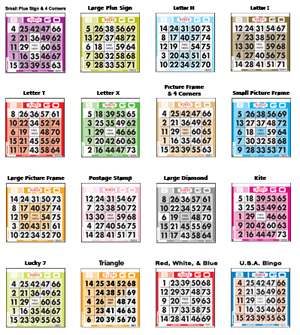 Preprints can be purchased in collated booklets or as loose, or padded specials on two of our regular lines of bingo papers; Champion™ (1-9,000 and 18,001-27,000 series) and King’s Line™(1-9,000 series). These are 9,000 faces to a set of preprints which are available in 18,000 different faces.